1. Ensure you have properly installed and connected to the Secure File Transfer Protocol client. 2. 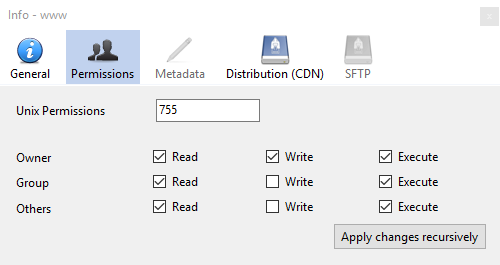 Once you are connected, navigate to the file or folder that you would like to change the permissions. If you want to change the permissions of multiple items in the same folder, click on the first item, press and hold the Ctrl key on your keyboard, and then click on the remaining items. The items should all be highlighted. 3. 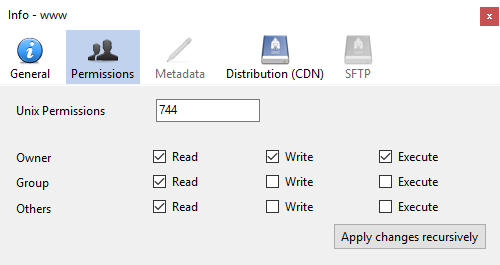 Select the file or folder, and click the Get Info icon. 4. You will be presented with an Info window, select the Permissions tab. 7. Close the Info windows to accept the permissions on a file or folder. File: selecting this permits users to read the data within the file. Folder: selecting this permits users to read the contents of the folder, allowing users to obtain a listing of the files and folders within the folder. Read access to a folder is not required to have read access to the files within the folder. File: selecting this permits users to write (change) the data within the file. Folder: selecting this permits users to write to the folder, allowing users to change the contents of a folder listing (such as adding and removing files). Write access to a folder is not required to have write access to files that already exist within the folder. File: selecting this permits the file to be executed as a program. Setting this permission for files that are not programs may cause difficulties with your account. Folder: selecting this permits access to information within the folder. Access is still controlled by the read and write permissions. If you created this file, then you are the owner. You can set permissions that apply only to yourself. It is possible to set permissions that deny access to your own files. As the owner of the file, it is always possible to change the permissions to give yourself access. If you have requested that special groups be set up to facilitate sharing data with colleagues, you can control permissions for group access. These permissions apply to all members of the group. These permissions apply to any user. If you provide write access in this category, you permit any user the ability to modify the information within the file.